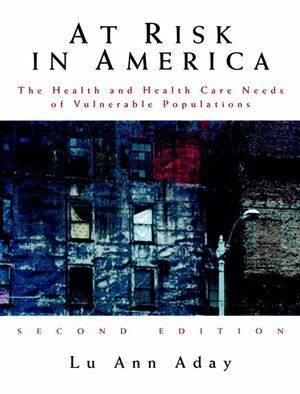 This updated second edition of At Risk in America provides a detailed analysis of those key population groups most vulnerable to disease and injury in the United States today-including homeless persons, refugees and immigrants, people living with AIDS, alcohol and substance abusers, high-risk mothers and infants, victims of family or other violence, and the chronically or mentally ill. Lu Ann Aday reviews the major theories and knowledge concerning these at-risk groups and offers new approaches and methodologies for tracing the social determinants and societal influences on health. She examines the specific health needs and risks faced by these groups, their experience in the health care system, the current policies and programs that serve them, and the research and policy initiatives that might be undertaken to help reduce their vulnerability. LU ANN ADAY is professor of Behavioral Sciences and Management and Policy Sciences at the University of Texas, Houston, School of Public Health. Her previous books include Designing and Conducting Health Surveys: Second Edition (Jossey-Bass, 1996) and Evaluating the Health Care System: Second Edition (1998). Foreword by Ronald M. Andersen. What Programs Address Their Needs? How Good Is Their Access to Care? How Much Does Their Care Cost? What's the Quality of Their Care? What Programs and Policies Are Needed? Resource A: National Data Sources on Vulnerable Populations. Resource B: Source Notes on the Data Tables.